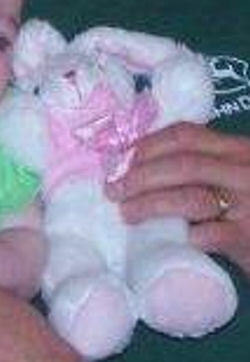 I need help finding a plush rabbit sold under the WalMart brand Easter 2008. The rabbit is white with pink on the inside ears and bottoms of its feet. It has a pink satin bow around its neck, with slightly darker pink polka dots. The rabbit’s about 9 inches long, without ears. The ears are floppy and about 4 inches long. When we bought the rabbit, my husband suggested I buy a few. I said no, it’s Walmart. If she likes it, I’m sure it’ll be here anytime. Boy was I wrong. My daughter won’t go anywhere without her “bun rabbit”. She’s 16 months old, and the poor rabbit is in bad shape. Thank you so much! I thought I’d searched every single bunny rabbit on Ebay. My daughter will be sooooo happy!